ArtBarrage presents FreeHand, a contemporary art auction in support of War Child. FreeHand features 56 artworks from Canadian and international artists in various media. Proceeds from the auction will benefit War Child, an award-winning charity that provides humanitarian assistance to war-affected children in some of the most devastated regions of the world. Tickets are $50 + tax and can be purchased HERE or at the door. Join us in supporting the creative programs of War Child to help children and families cope with the effects of war in the places they live. Let’s wage war on the bidding floor where everybody wins. 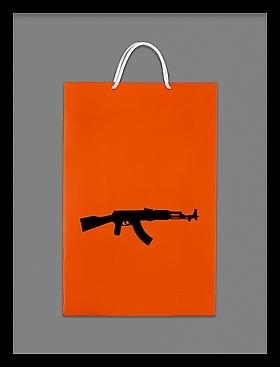 Image credit: New Remote, “AK-47 Retail (Serbian Edition)”, 2007, offset print on paper bag in shadow box frame, edition of 7, 22.5" x 17"